Joan was the youngest of five children of Jacques d’Arc, a peasant farmer. She was only thirteen when she experienced the first of her visions, which she described as a voice accompanied by a blaze of light. She later identified the voices as those of St. Michael, St. Catherine, St. Margaret and others. They revealed to Joan that her mission in life was to save France by assisting the Dauphin, the rightful heir to the throne of France. When she tried to embark on her mission, she was scoffed at by the French commander and initially ignored by the Dauphin, who preferred the life of luxury to pursuing his father’s throne. Eventually, however, Joan convinced the civil and church authorities that she was not a heretic and did have a mission to save France. 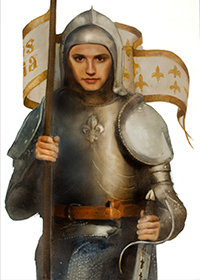 Clothed in a suit of white armor, Joan led an expedition to relieve the besieged city of Orléans. After this success, she gained a great victory over the British and, shortly after, captured Troyes. The Dauphin was crowned King Charles VII in 1429 as a result of her victories, and Joan stood at his side during the coronation. Having accomplished her major mission, success came harder for Joan. But she failed in an attempt to capture Paris and, in 1430 during a new campaign, was captured and sold to the British who occupied much of France at this time. Charged by the British with heresy and witchcraft, her visions were declared to be of diabolical origin. She was tricked into signing a recantation, but, a few days later, she again dressed as a boy, a practice that she had agreed to abandon. Joan was charged as a lapsed heretic and condemned to be burned at the stake. This occurred on May 30, 1431, in Rouen, France. Joan, known as the Maid of Orléans, was cleared of the charges against her by a court appointed by Pope Callistus II in 1456 and she was canonized in 1920. Together with St. Denis, Joan of Arc is a patron of France. Her memorial is celebrated in that country on May 30. Joan's message today: Joan was cast into an unfamiliar and unexpected role by God and sent on a mission with specific goals. We are often asked to perform unusual, if less dramatic, tasks than Joan’s. Usually, the only ill consequence to us might be embarrassment or inconvenience. Have you ever been asked to run an errand for a sick neighbor or visit an elderly or lonely person? Have you done it with good grace or have you privately grumbled?